During our early video game years we used to pump coins in magical machines that would entertain us for as long as our pocket could handle. There is something really awesome about those arcade shooters and it's not just good childhood memories that pull us to them. It's the simple fun of playing them: blinking lights everywhere, quick reflexes, thousands of ships to destroy, upgrading your own ship with cooler-stronger weapons, playing the same level for 21st time in order to get it right. Not many cool arcades would hit our humble PC screens, but Tyrian was one of them. 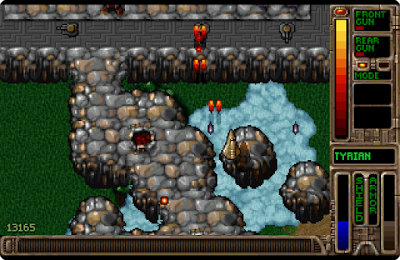 Tyrian was released by Epic Megagames(the usual suspect) in 1995 and it was brilliant. It had everything that we loved about arcades. OpenTyrian is a remake of the original game by a group of dedicated developers. Of course as the name implies it is open source and free. It is faithful to the original and it even has an extra level. The game takes place in the far future where as usual mankind is in trouble. The plot in this kind of games does not matter but Tyrian is kind enough to provide us with one for whoever wants it. There are datacubes that we gather and after each level we we read the new data that progresses the story. During the levels we gather coins to upgrade our ship with bigger weapons, better shields and other cool enhancements. Download the game, grub your joypad and start killing thousand of spaceships throughout the galaxy.